I like to remind people from time to time that WAND has made its General Business Taxonomy available as a free download for users of SharePoint 2010. The WAND General Business Taxonomy is designed as a starter set of terminology that should be relevant to nearly any business organization. If you are looking for taxonomy covering other topics, WAND's Taxonomy Library for SharePoint is extensive. 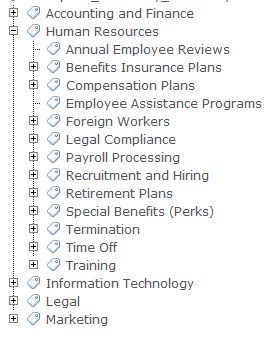 WAND also has professional services to help you customize taxonomies or to create taxonomies from scratch. We are happy to help with any of your taxonomy needs in SharePoint and we have years of expertise.